I love the flavors of a good pesto, and how it can transform a simple dish into something delicious. Unfortunately, finding a dairy-free option at the store can be tricky, and I don't always keep fresh basil on hand to make my own. There are a few great versions available at Whole Foods Market, if you're interested in buying one~ but it's actually really simple to make! All you need is a food processor, and a few simple ingredients. 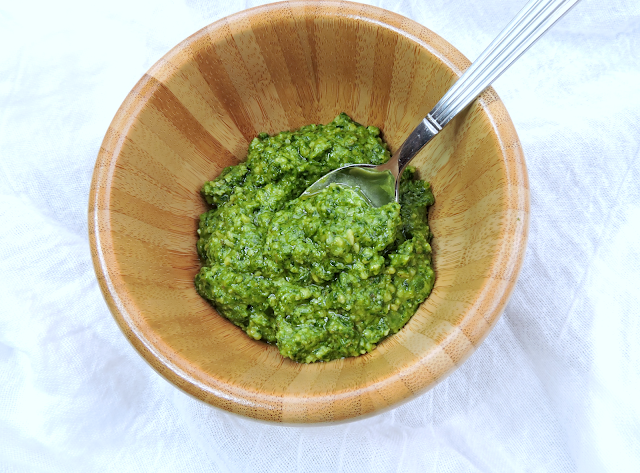 Traditional pesto is done with fresh basil, pine nuts, and parmesan cheese, but of course I switched things up to make it more convenient and Paleo-friendly. First, I swapped the basil for spinach (because we always have spinach on hand & I actually love the flavor it gives). I then ditched the pine nuts, mainly because they're expensive and I don't feel like they're necessary. I used cashews instead~ they give that toasty "nutty" flavor, and also serve as a great replacement for the Parmesan cheese. 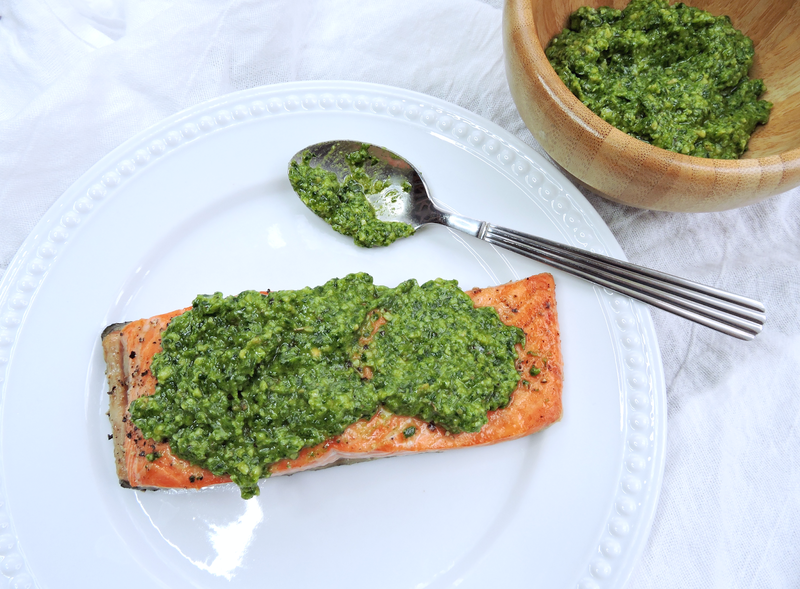 Just a couple minutes of prep time, and you've got the perfect pesto that you can use in so many ways! Spread it over chicken or fish for a burst of fresh flavor, or stir it into spaghetti squash as a "pasta sauce". I also love what pesto does to scrambled eggs~ just mix in a tablespoon or so after cooking! Let me know if you give this a try, and tag me in your Instagram photos so I can see how you decide to use it! Toast the cashews in a small, dry sauté pan over medium heat until fragrant and lightly browned. Place all of the ingredients, except the oil, in a food processor. Pulse to combine. Slowly incorporate the oil while the machine is running, until a smooth paste-like consistency forms. Continue blending to thin the sauce to your preference. Serve over meat, stirred into spaghetti squash, or mixed with scrambled eggs. Store leftovers in an airtight container in the refrigerator. 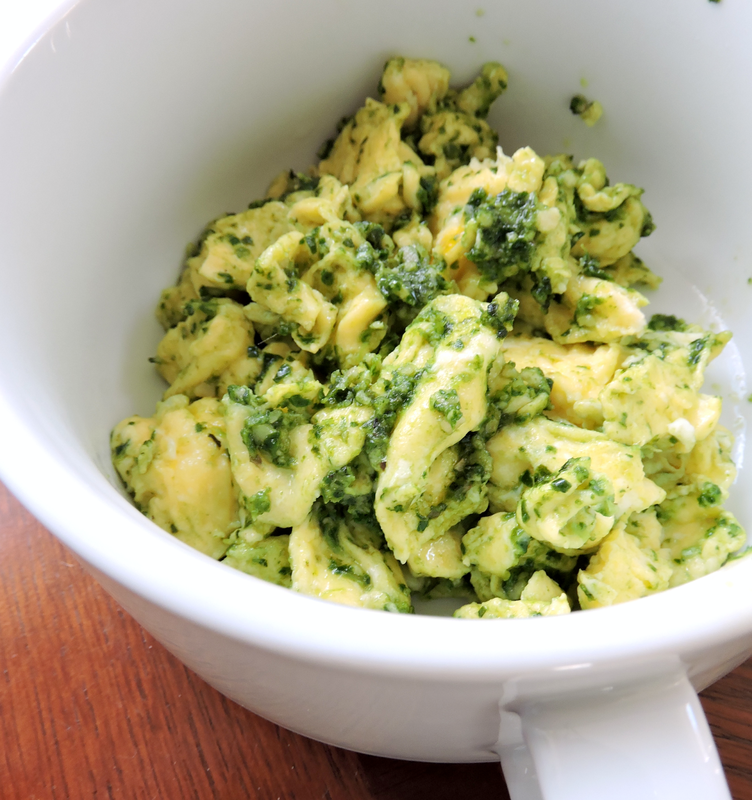 If you want to make a traditional basil pesto, simply substitute fresh basil for the spinach. I prefer using a food processor, but you could also try using a blender.